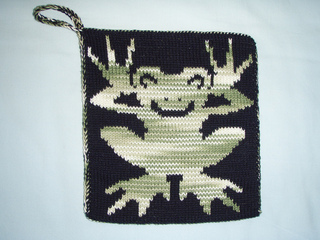 This pot holder is done in Double Knitting (DK). 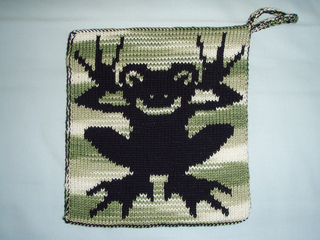 Stop frogging your knitting and knit a frog instead! Instructions for the DK technique is not included in the pattern. If you’re not familiar with DK you’ll need to find other information about cast on and the knitting technique. Use two contrasting colours of mercerised cotton 8/4 (often used for crocheting). About 50 grams of each colour is used for a pair of pot holders. If your gauge isn’t the suggested the pot holder will get bigger if you have fewer stitcher per 10 cms and smaller if you have more stitches per 10 cm. Feel free to use the design for other items (eg. blanket) but be ware that the yardage may be completely different with another type of yarn. The designer no longer uses the designer name “Karin Knutsdotter”. She uses her own name which is Maria Ekblad.